Nearly everyone thinks annually when creating long-term calendars. Planning one year ahead of time just feels right. It provides you with some easy start and end dates — your schedule begins today and finishes this time next year. And you can break it up into smaller time spans of three months each. Simple. But I’d argue that you’ll be more organized and get more done by planning just a little further ahead. Instead of one year, lay out your schedule for 18 months. 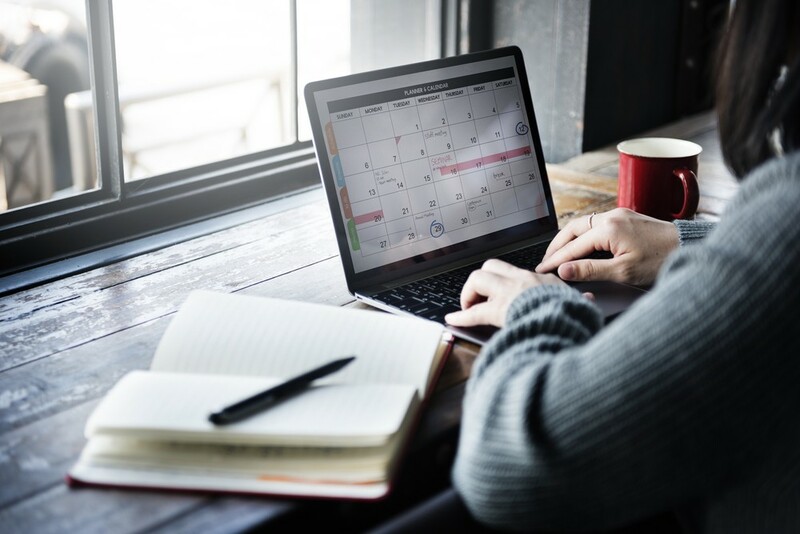 Planning a year-and-a-half ahead gives you a little more room to identify trends in both work and life—and lets you take advantage of fluctuations in your calendar. Think of it like planning a vacation. There are always peak seasons and off-seasons. Depending on where you want to go, it’s better to plan your vacation during one time instead of another. Being off cycle has its advantages. The same logic applies to business. Eighteen months provides you with the necessary length of time to identify the different seasons in your industry and to decide how to make the most of them. So it’s an ideal time frame for any corporate strategic planning. You can perceive trends and changes in your schedule well ahead of time. Look at your calendar right now. I’m betting the next two months are packed. The months after that, however, are probably fairly empty. Those months aren’t really empty at all. As the weeks go by, your schedule will begin to fill up. And if you’re only looking a month or two ahead, you’ll be shocked when you reach an extremely busy portion of your year. Even something that’s not on your work schedule — say, the start of your child’s Little League season — can have an outsized impact on the amount of time you have at your disposal. By planning in a long-range fashion, you’ll begin to notice trends that you wouldn’t have using an annual style of planning. One year isn’t always enough time to pinpoint and analyze those patterns. Sometimes, events and invites are right on the edge of your year-long schedule. For me, an 18-month calendar provides a different perspective about my schedule. But this time frame isn’t a hard-and-fast rule. The point is to consider upcoming commitments and work trends beyond the standard business year. It’s a unique way of looking at the future, although not many people take advantage of it. You can reach out to your network when it will maximize your impact. We all know there are times during the year when offices turn into ghost towns. When I started working in corporate America, I was surprised to find that the end of August was so slow. I’m Indian, and the notion of going on vacation at the end of August wasn’t something I grew up with. Fourth of July, New Year’s, Labor Day — most people use these holidays to go on longer vacations. These idle times are actually when it may be easiest to set up meetings or get in touch with people who are normally harder to reach. If the person you’re after is in the office that week, you may be able to connect with them on short notice. You won’t catch everyone you’re trying to get ahold of, but even just one or two meetings during typically less-productive times will enable you to get much more done. And a good long-range schedule helps you stay cognizant of these opportunities. You can get a sense of what’s coming and plan accordingly. Just as there will be times when you want to plan a meeting or catch-up call during “off-season,” there will also be times when you’re trying to do something at the same time as everyone else. For instance, I go to the JP Morgan conference every year. It’s a lot of fun, but it’s also takes some real endurance. I’m meeting people, chatting, and listening to speakers all day. I have to be “on” from roughly seven in the morning to 11 at night. My schedule is packed during the day, then there are dinner meetings (sometimes more than one) and corporate events at night. I’ve even noticed that on the way to the event, the airport and plane is buzzing with chatter. But on the way back, everyone is trying to avoid each other’s gaze — exhausted from non-stop meetings. If you know to anticipate those hectic events, you can arrange your schedule to reflect your exhaustion afterwards. You may want to take some time off, or schedule a break to recuperate. I know plenty of people who take the weekend after the JP Morgan conference to stay in California, go to Sonoma Valley, and generally relax before getting back to work. You can internalize your schedule. This planning method works best when you create your schedule from scratch. There are all kinds of great calendar apps that work really well for keeping you informed about your daily, weekly, or monthly obligations. But I’ve found that I internalize my long-term plan best if I create it by hand. Seriously, I take a big 11×17 piece of paper, physically draw the lines to break it down by month, and write out my next 18 months. Once I’ve done that, I don’t have to continuously check it. It’s not like I’m dragging the schedule around with me everywhere I go. It’s more a mental model that I’ve plotted out in my head by drawing it physically. It can be difficult to think this far in advance. It’s tough to plan 18 months into the future when you have so much on your plate this month alone. But if you take the time now to create a long-term plan, I promise it will make the rest of your scheduling simpler.